This blog post is inspired by the some of the misconceptions around flux residue on assembled circuit boards. There's an enormous amount of information about the topic that you can easily find online, but I wanted to give our visitors and customers a concise run-down on the different types of flux being used in the industry. Hopefully, I can clear up some confusion or give people more insight into the manufacturing process. For more information I linked to three different articles at the bottom of the post and, of course, the VR Industries team is always available to answer specific questions. Flux is a substance that is used to remove oxidation on electronic component leads and the pads on a printed circuit board to aid in metallurgical bonding. It is difficult to create a robust metallurgical bond during soldering operations when oxidation is present. Therefore, flux is used to remove the oxidation and prevent poor solder connections that could result in degraded product reliability. Flux comes in three main categories: Rosin, Water Soluble, and No-Clean. Each one has a benefit and drawback, so It’s important to choose the right flux for the right applications. Flux is corrosive - if it is not used and cleaned correctly, the circuit board suffers damage related to corrosion. The amount of damage correlates to the concentration of activators in the flux. A higher concentration of activators in the flux means a more significant potential for damage resulting from the chemical reaction that takes place during the oxidation removal process. EMS providers have the experience needed to select the proper flux for an application but, if you have questions, they can answer them for you. Here is an overview of the types of flux used during PCB assembly. Rosin flux is an older industry standard that is becoming increasingly uncommon. It’s derived from the sap of pine trees and contains several different active acids that trigger a chemical reaction to remove oxidation. 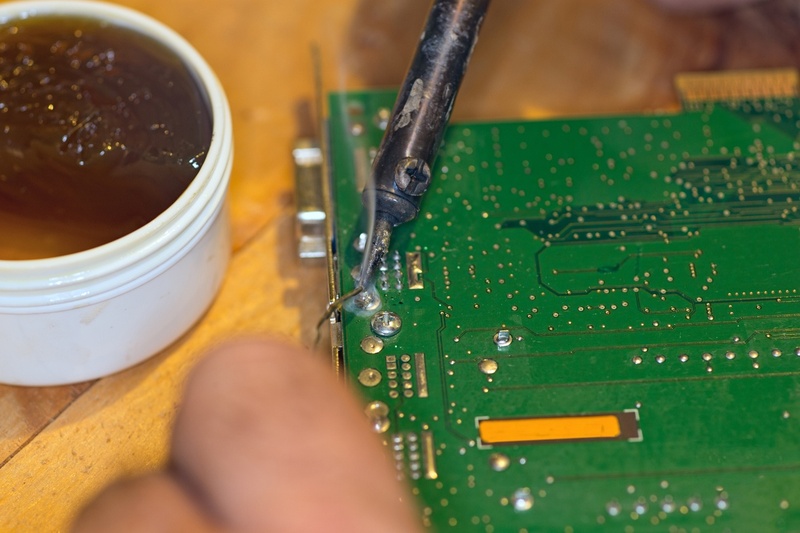 After completing the soldering process, a residue is left behind on the printed circuit board. It's crucial to remove the residue because of it's acidic and corrosive properties. Removing the residue requires converting the rosin flux residue to a rosin soap and then washing it off. Disposing of the resin soap is then accomplished with deionized water. After this process, the circuit boards are clean and free of conductive debris. The uncleaned residue is a yellowish or brown waxy material much like pine tree sap. Rosin flux is also available in three “strengths” which is a measurement of the number of acid activators in the flux. There are three classifications; each one describes the strengths. The classifications are R, RMA, RA. The strongest one is RA, containing the highest concentration of activators. Engineers created water-soluble flux because of the complications surrounding rosin flux. We can point to a specific time in history that accelerated the development of water-soluble flux. It’s known as the Montreal Protocol, which is a global agreement to limit the use of products that deplete the ozone. The Montreal Protocol is related to flux through the cleaning agents used to remove rosin flux. CFCs were typically used in flux removal but were also a banned substance after the Montreal Protocol. Engineers had to develop a new type of flux that didn’t require CFCs in the cleaning process. You can also refer to water-soluble flux as organic acid flux; both terms are common throughout the industry. It’s typically derived from a glycol base with high concentrations of activators, meaning water soluble flux is often more corrosive than rosin flux. Cleaning water soluble flux is much easier than cleaning traditional rosin flux, but because the water-soluble flux is more corrosive, cleaning it must be completed quickly and thoroughly. Not all water-soluble flux is organic. There is also water-soluble inorganic flux. Typically, water-soluble inorganic flux is far more corrosive than the already corrosive organic flux. The levels of corrosiveness seen in water-soluble inorganic flux make it a less common choice in electronics manufacturing. Finally, you can find no-clean flux. No-Clean is a mix of organic resins and inorganic activators that, in theory, alleviate the need to clean the residues off the board. No-Clean flux does leave behind varying levels of residue depending upon the chemical composition, but this residue is not harmful to the circuitry. You’d assume that there is never a need to clean no-clean flux, but the evidence is surfacing that no-clean flux can be harmful to circuity if it’s not applied correctly during the manufacturing process, specifically with boards that are using smaller components and tighter spacing between these components. Insufficiently heated flux can, in some instances, retain corrosive properties after the soldering. Additionally, because of the smaller spaces between components and the smaller standoff heights, off gasses and trace amounts of liquids can become trapped under components. Over time this trapped material can degrade the circuitry. Also, depending on the no-clean flux, more residue can be left behind on the circuit board. Some OEMs do not like the appearance of the residue and ask for it to be washed off. Additionally, the residue may not be corrosive or conductive, but it is still material that can dislodge and cause unpredictable problems. Cleanliness is typically a concern for military spec and medical grade products. If you have any questions, contact us, and we’d love to talk to you.